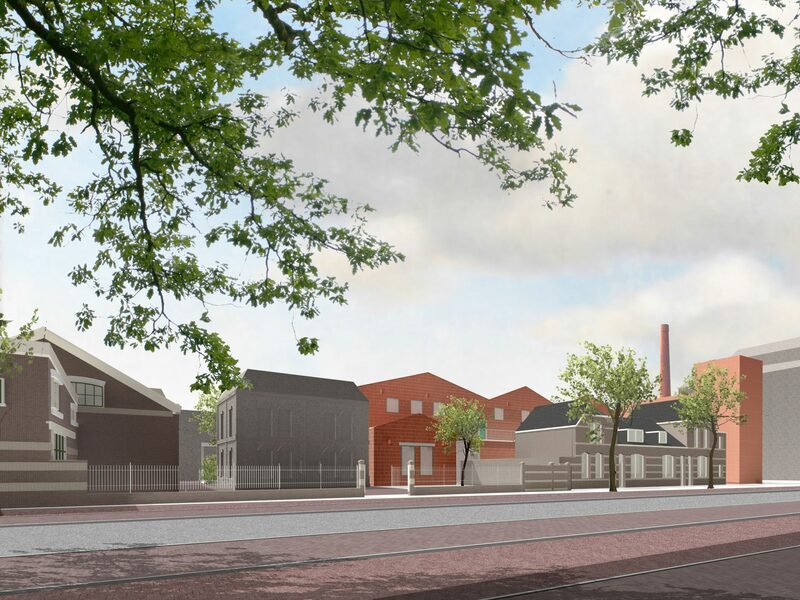 The CultuurCentrale proposes a rehearsal accommodation for dance and theatre in the so called Ebbingekwartier, a former industrial area in the city center of Groningen. The location is situated next to the old Machine Factory, which is already in use as a dance and theatre studio. 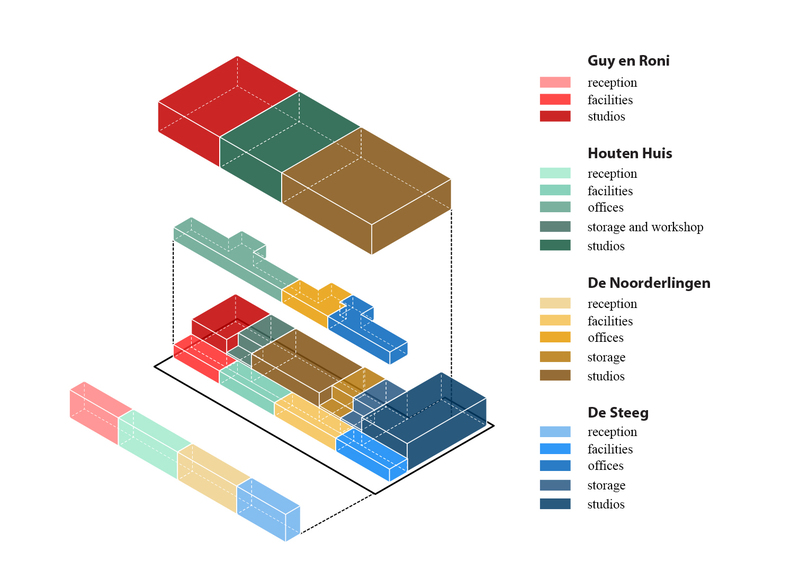 The new accommodation should house four different companies which are currently scattered around the city. The assignment has a somewhat ambivalent character. The different accommodations should together function as a site-specific ensemble that revitalizes the area with cultural activity. However, the future program is rather closed (dance and theatre studios) and each company prefers to maintain its own identity and a maximum amount of flexibility to adjust their accommodation within the complex. 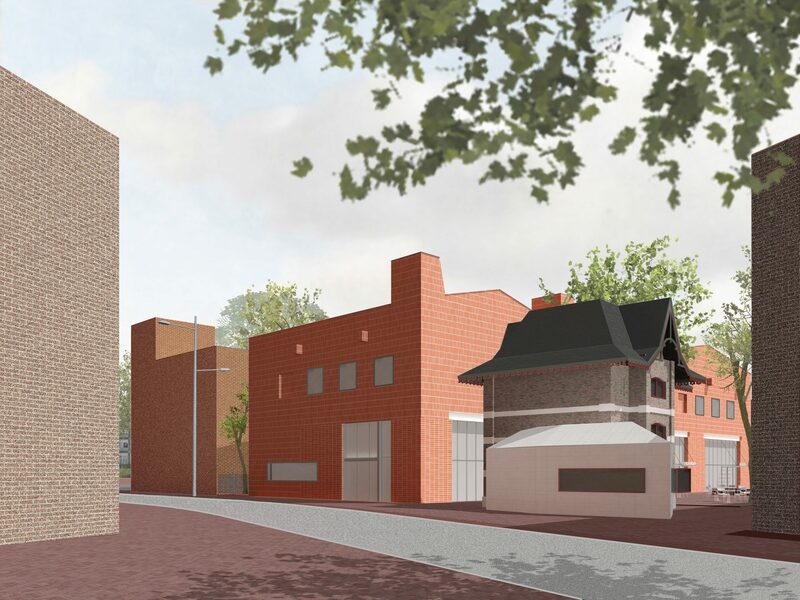 CultuurCentrale proposes a compact and rational building that maximally opens up towards the ‘route van de ziel’, a public route that connects the different historical remnants of the Ebbinge Kwartier. The building is perceived as a factory. 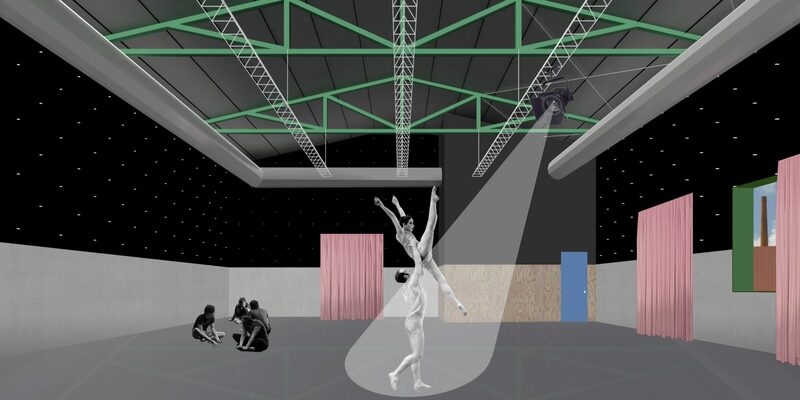 Apart from the reference to the history of the site, the archetype of the factory hall fits perfectly with the demands for rehearsal studios for dance and theatre productions: large column free spaces that are flexible in use and have a functional and no-nonsense finish. Also, the compact and rational setup of the building answers to the complex urban situation, the tight budget and the ambition for a net-zero energy building. The building is set up as a linear series of programmatic zones for studios, offices, dressing rooms and foyers. The three largest studios are placed upon the smaller studios and storage spaces to create a compact and structurally logical configuration. Underneath the cantilevering large halls is a 6-meter-high zone with offices, facilities and foyers. All four entrances are situated along the route van de ziel and open up generously towards the surrounding public space. 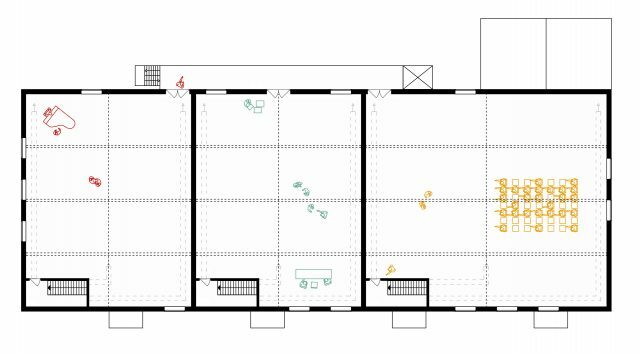 A strip of facilities (dressing rooms, toilets and kitchens) separates the public entrance zone from the rehearsal studios. The offices are situated on top of the facility zone and look out over both the entrance and the rehearsal studio’s. The rational linear layout of the building allows for a lot of cross-overs between the different companies, and introduces a maximum amount of flexibility for the wishes of the different users, now and in the future. The concentration of all circulation space in the double high foyers creates a very spacious and lively entrance for all four institutions. The high glass facades enhance the openness and interaction with the surrounding city and create a clear individual entrance for each company. The partition of each programmatic zone is flexible and differs per zone. 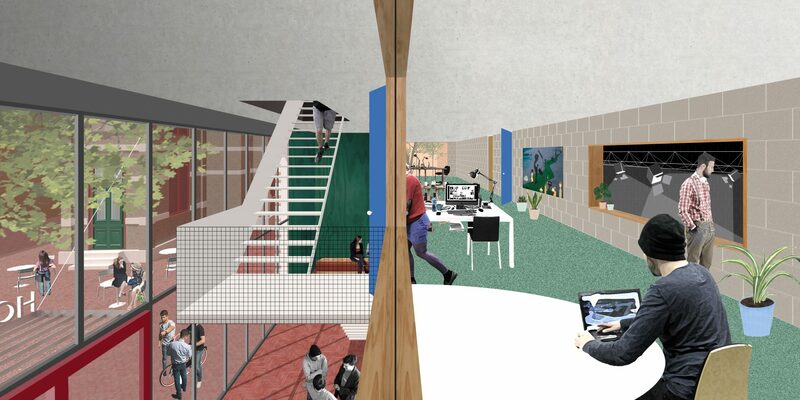 Only the walls between the rehearsal studios are loadbearing, creating a lot of freedom to adjust the individual entrances, facilities and offices to the wishes of the different institutions. 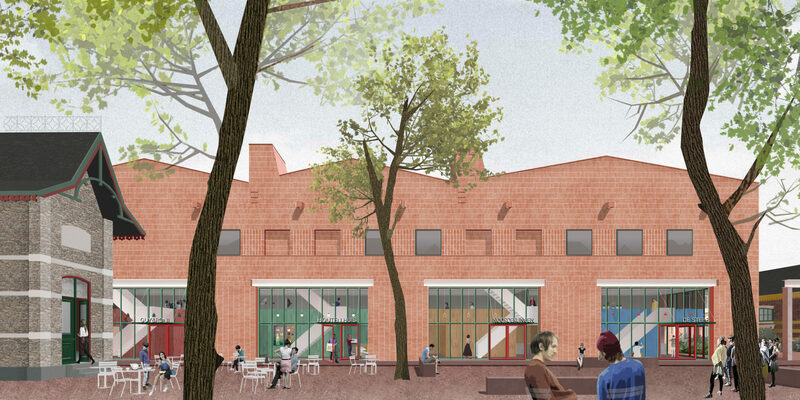 Along the new building the route van de ziel will be designed as a multifunctional square that can accommodate exterior cultural functions and events. The public square forms the connection between the different companies and creates an urban ending to the route. The pubic space within the ensemble becomes part of the shared domain of the different cultural institutions. 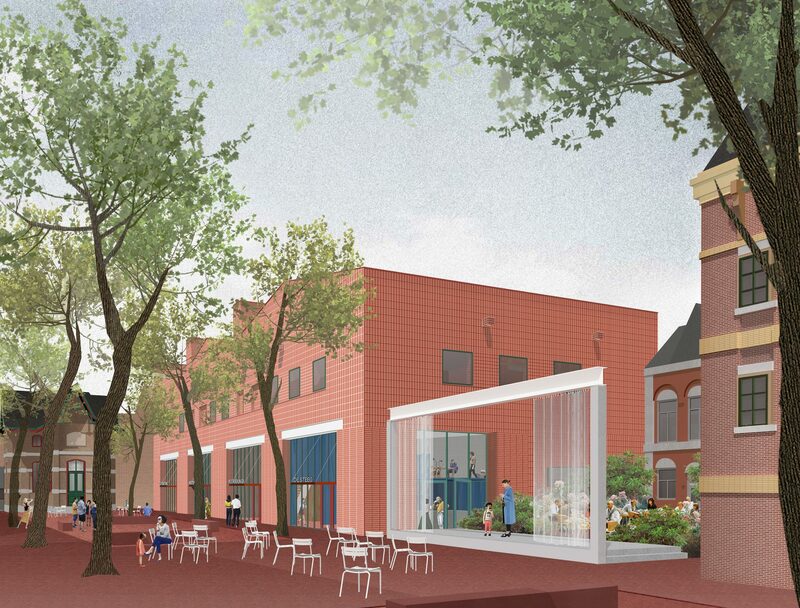 Bordered by the existing monumental factory wall on the one side, and a new pergola on the other, the area will be designed as a green garden with outdoor work and meeting spaces. 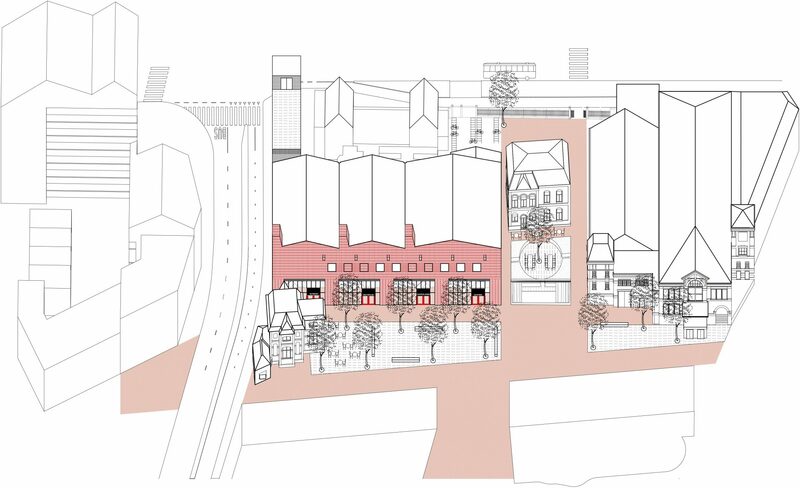 The architectural appearance of the building seeks a balance between the continuity of the existing city and the industrial history of the location on the one hand, and the recognizability of the new on the other. The facades are composed of brick, resembling the existing Machine factory, but the appliance of the material is consciously different in both color and type. By using wire-cut brick and white seams in a tiled pattern a contemporary and industrial look is created with a graphical quality that forms a subtle contrast with the traditional brick architecture of the Machine Factory. On the first floor the facade flips from a horizontal to a vertical pattern. 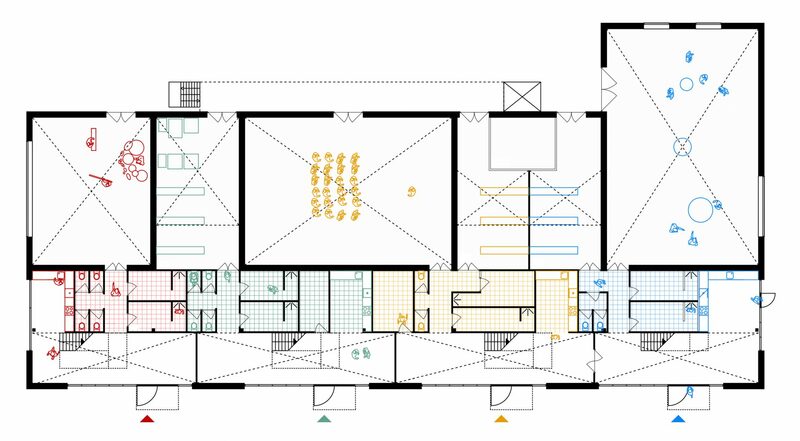 This creates a double high plinth that subtly refers to the internal organization of stacked halls inside the building. For the interior, the analogy with the factory is continued further by using industrial materials that are selectively (un)finished. There is a clear contrast between the interior of the entrance area, and that of the rehearsal studios. The flexible interior of the foyer, facilities and offices consist of light walls which are clad with panels of underlayment. 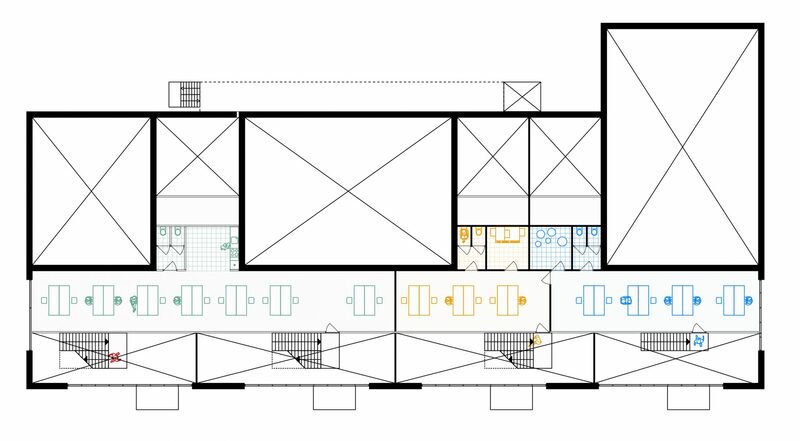 Each institution is free to appropriate these spaces, creating a clear and distinct identity for each individual organization in the building. The concrete walls of the rehearsal studios will only be finished there where acoustically necessary. 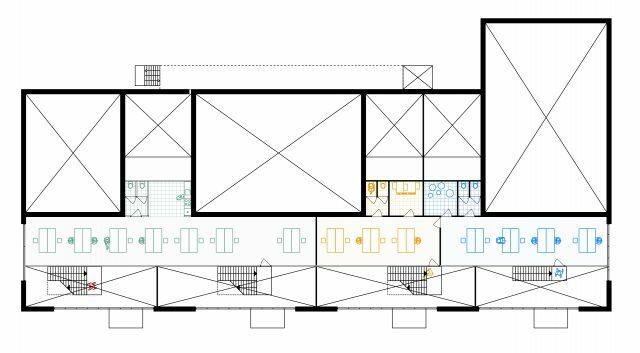 From two meters upwards the walls will clad with a theatrical padded surface which contrasts with the atmosphere of the industrial hall. Also, the curtains have an acoustic effect and add to the contrast between theatre and factory.